(1) Mnemonics which are formed from a Scriptural passage, a mishnah, a halakic sentence, or a proverb or maxim taken from life or from nature. 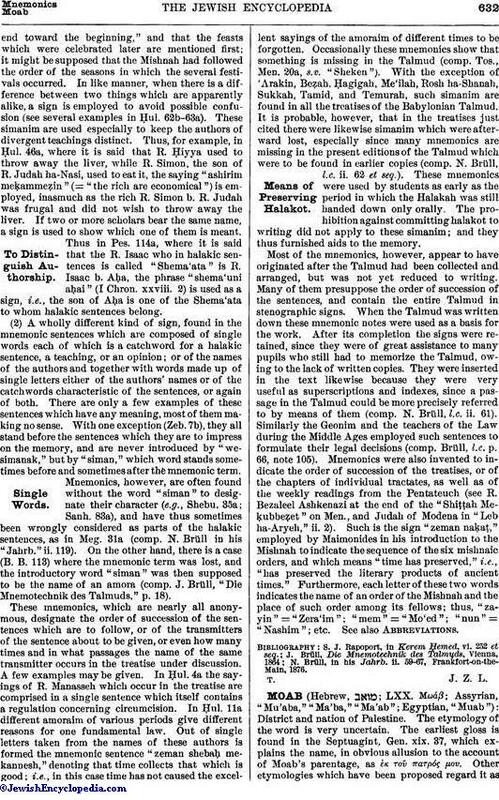 These simanim, which are introduced by the word "we-simanak" (= "and let thy sign be"), stand invariably after the halakic sentences for which they serve as signs; and it is usually stated who invented and used them. Many originated with the Babylonian amora R. Naḥman b. Isaac, who employed them with special frequency. They occur very often in 'Abodah Zarah, Ḥullin, and Shabbat, as well as in Bekorot, 'Erubin, Yebamot, Ta'anit, and the remaining treatises. Mnemonics are used to prevent confusion where for any reason it might easily occur. Thus Ps. cxxxix. 5a ("Thou hast set me behind and before") is employed as a mnemonic for 'Ab. Zarah 8a, to show that in the enumeration of heathen feasts the Mishnah "goes from theend toward the beginning," and that the feasts which were celebrated later are mentioned first; it might be supposed that the Mishnah had followed the order of the seasons in which the several festivals occurred. In like manner, when there is a difference between two things which are apparently alike, a sign is employed to avoid possible confusion (see several examples in Ḥul. 62b-63a). These simanim are used especially to keep the authors of divergent teachings distinct. Thus, for example, in Ḥul. 46a, where it is said that R. Ḥiyya used to throw away the liver, while R. Simon, the son of R. Judah ha-Nasi, used to eat it, the saying "ashirim meḳammeẓin" (= "the rich are economical") is employed, inasmuch as the rich R. Simon b. R. Judah was frugal and did not wish to throw away the liver. If two or more scholars bear the same name, a sign is used to show which one of them is meant. Thus in Pes. 114a, where it is said that the R. Isaac who in halakic sentences is called "Shema'ata" is R. Isaac b. Aḥa, the phrase "shema'uni aḥai" (I Chron. xxviii. 2) is used as a sign, i.e., the son of Aḥa is one of the Shema'ata to whom halakic sentences belong. (2) A wholly different kind of sign, found in the mnemonic sentences which are composed of single words each of which is a catchword for a halakic sentence, a teaching, or an opinion; or of the names of the authors and together with words made up of single letters either of the authors' names or of the catchwords characteristic of the sentences, or again of both. There are only a few examples of these sentences which have any meaning, most of them making no sense. With one exception (Zeb. 7b), they all stand before the sentences which they are to impress on the memory, and are never introduced by "wesimanak," but by "siman," which word stands sometimes before and sometimes after the mnemonic term. Mnemonics, however, are often found without the word "siman" to designate their character (e.g., Shebu. 35a; Sanh. 83a), and have thus sometimes been wrongly considered as parts of the halakic sentences, as in Meg. 31a (comp. N. Brüll in his "Jahrb." ii. 119). On the other hand, there is a case (B. B. 113) where the mnemonic term was lost, and the introductory word "siman" was then supposed to be the name of an amora (comp. J. Brüll, "Die Mnemotechnik des Talmuds," p. 18). These mnemonics, which are nearly all anonymous, designate the order of succession of the sentences which are to follow, or of the transmitters of the sentence about to be given, or even how many times and in what passages the name of the same transmitter occurs in the treatise under discussion. A few examples may be given. In Ḥul. 4a the sayings of R. Manasseh which occur in the treatise are comprised in a single sentence which itself contains a regulation concerning circumcision. In Ḥul. 11a different amoraim of various periods give different reasons for one fundamental law. Out of single letters taken from the names of these authors is formed the mnemonic sentence "zeman shebaḥ mekannesh," denoting that time collects that which is good; i.e., in this case time has not caused the excellent sayings of the amoraim of different times to be forgotten. Occasionally these mnemonics show that something is missing in the Talmud (comp. Tos., Men. 20a, s.v. "Sheken"). With the exception of 'Arakin, Beẓah. Ḥagigah, Me'ilah, Rosh ha-Shanah, Sukkah, Tamid, and Temurah, such simanim are found in all the treatises of the Babylonian Talmud. It is probable, however, that in the treatises just cited there were likewise simanim which were afterward lost, especially since many mnemonics are missing in the present editions of the Talmud which were to be found in earlier copies (comp. N. Brüll, l.c. ii. 62 et seq.). These mnemonics were used by students as early as the period in which the Halakah was still handed down only orally. The prohibition against committing halakot to writing did not apply to these simanim; and they thus furnished aids to the memory. Most of the mnemonics, however, appear to have originated after the Talmud had been collected and arranged, but was not yet reduced to writing. Many of them presuppose the order of succession of the sentences, and contain the entire Talmud in stenographic signs. When the Talmud was written down these mnemonic notes were used as a basis for the work. After its completion the signs were retained, since they were of great assistance to many pupils who still had to memorize the Talmud, owing to the lack of written copies. They were inserted in the text likewise because they were very useful as superscriptions and indexes, since a passage in the Talmud could be more precisely referred to by means of them (comp. N. Brüll, l.c. ii. 61). Similarly the Geonim and the teachers of the Law during the Middle Ages employed such sentences to formulate their legal decisions (comp. Brüll, l.c. p. 66, note 105). Mnemonics were also invented to indicate the order of succession of the treatises, or of the chapters of individual tractates, as well as of the weekly readings from the Pentateuch (see R. Bezaleel Ashkenazi at the end of the "Shiṭṭah Meḳubbeẓet" on Men., and Judah of Modena in "Leb ha-Aryeh," ii. 2). 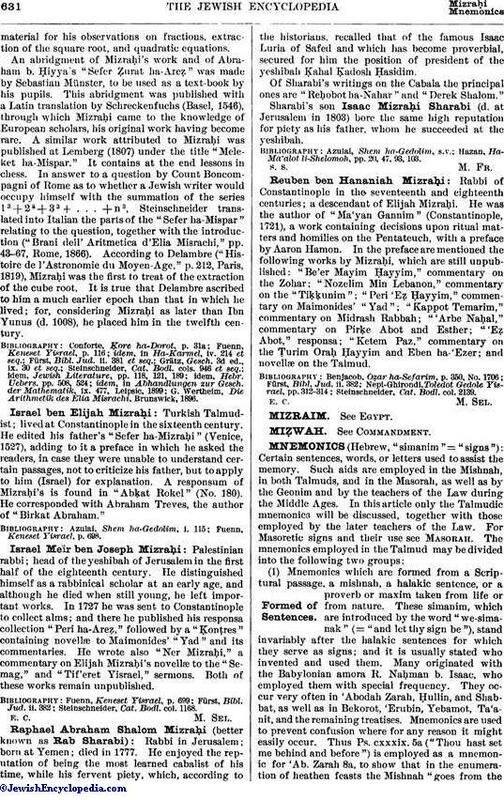 Such is the sign "zeman naḳaṭ," employed by Maimonides in his introduction to the Mishnah to indicate the sequence of the six mishnaic orders, and which means "time has preserved," i.e., "has preserved the literary products of ancient times." Furthermore, each letter of these two words indicates the name of an order of the Mishnah and the place of such order among its fellows; thus, "zayin" = "Zera'im"; "mem" = "Mo'ed"; "nun" = "Nashim"; etc. See also Abbreviations. N. Brüll, in his Jahrb. ii. 59-67, Frankfort-on-the-Main, 1876.